The Pretty Dish CookBook Tour! IT’S HERE! Eeeeep! I’m so excited to tell you guys about The Pretty Dish CookBook Tour! First, I cannot thank you guys enough for all your amazing support with this book. I am so thankful for you and would LOVE to see you! I’m spreading things out a bit more this time (because… kiddos!) and can’t wait to meet you. With my last book launch, the events were the highlight of the entire thing. You guys were amazing. Below are the book tour dates we have planned so far. There are others coming too, but I’ll add those in once we have a solid date – so this coming week, be on the lookout for a few more dates (…L.A., Philly, Cleveland, D.C.)! And if you haven’t ordered your copy of The Pretty Dish yet, you can do so right here! Remember that for one more week, you can get your hands on this FREE bonus cookbook if you order! And you can always bring your book with you to a signing. If you preordered a copy (thank you so much!) and plan on bringing it to the book store, I would LOVE for you to still find a way to support the book store, be it buying an extra copy as a gift or finding something else special there. I adore brick and mortar book stores and want to show them all the support that I can! *bubbles + bites will be served! A special bundle will be offered in honor of the event: a Courtly Check Round Tray, Large Morning Glory Practical Pitcher, Morning Glory Serving Bowl, and a signed copy of The Pretty Dish for $191.25 (pre-tax), 25% off the retail price. *this is a ticketed event. $45 includes a signed copy of The Pretty Dish, wine, snacks and beauty DIYs. so fun! 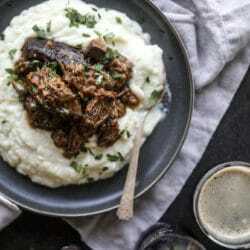 Slow Cooker Guinness Short Ribs with Cheesy Cauliflower Mash. You know how warm and stunningly beautiful San Diego is, right? And we have Legoland, Sea World, the best Zoo in the country and that little Disneyland place just up the road! Working vacation with the kiddos? The west coast would love to meet you! :)!